I hope everyone had a wonderful Thanksgiving feast and are now recovering from your turkey coma; I know I am! After making the Pennant Parade Easel card I posted Wednesday, I wanted to make another easel card, so I made this cute butterfly place card/note card. I used the great Beautiful Butterflies Die and the Big Shot to die cut the butterflies to make the easel. 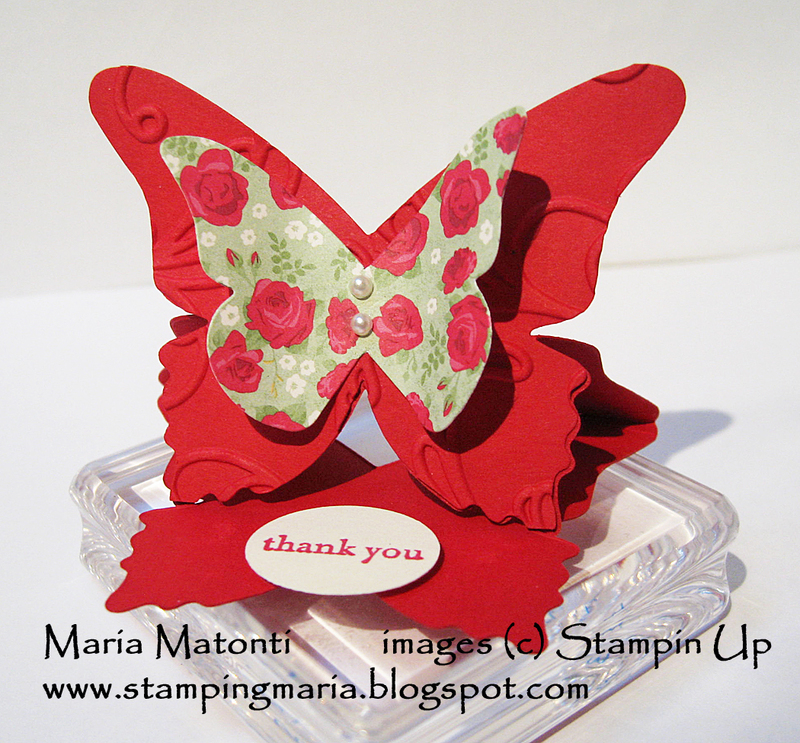 Then I ran one of the butterflies through the Elegent Lines Embossing Folder and die cut a smaller butterfly using the Holly Berry Bouquet DSP in the current Mini Catalog. I stamped the phrase from the Teeny Tiny Phrases stamp set and punched it out with the smallest oval punch SU has. Added 12/4/11: I posted a video showing how to make this butterfly easel here. I hope you like it and contact me if you have any questions! You are too sweet!! After reading your email I just had to check out your new blog and it is awesome!! So if your work so I am happy to feature you on My Crafty Picks and I just love this easel card!! Make sure to stop by on Sunday to check out all the picks and to pick up your blog badge for being featured!! Hi Maria--what a pretty card--congrats on your feature. Do you have instrucitons on this card?